Return to Israel to discover off-the-beaten-path treasures in the Jewish Homeland. Together, we’ll make new discoveries in the ancient city of Jerusalem and the modern metropolis of Tel Aviv. We’ll explore the beautiful terrain of the lush Carmel Mountain and the rugged Negev Desert, and we’ll tap into the innovative spirit that defines nearly every aspect of Israeli society today. Israel Revisited is scheduled to coincide with the national holidays of Yom HaShoah (Holocaust Remembrance Day), Yom HaZikaron (Memorial Day), and Yom HaAtzmaut (Independence Day). Together we’ll observe the national siren where the entire country stands in honor of those who have been lost, and we’ll experience the authentic joy of celebrating Israeli independence, dancing in the streets of Tel Aviv. On Israel Revisited, you’ll broaden your perspectives and gain a fresh appreciation for a country small in size but big on wonders! Evening: Join in Tel Aviv’s local Yom Haatzmaut celebrations! Benefit from our no-hidden-costs approach so you can enjoy your experience to the fullest! With the exception of one meal a day and gratuities, Israel Revisited is an all-inclusive package. Sign up at least four (4) months in advance to lock in your spot and receive a $100/person discount. All payments are fully refundable up to four (4) months in advance! Israel Revisited is led by a licensed Israeli guide who accompanies the group on a 24/7 basis. Our staff are charismatic educators eager to share the beauty of Israel. Each group is assigned a deluxe touring bus with a dedicated driver. Israel Revisited is an active tour designed for adults. Our days are full of experiences designed to provide you with the full flavor of Israel. Although the program does not have age guidelines, the itinerary involves a good amount of walking and some long days. Participants may take a break from the active schedule at their own discretion. What's the composition of the group? Israel Revisited groups generally range from 15-30 travelers. Average group size is 20 travelers. Israel Revisited is a pluralistic Jewish travel experience open to all. Group meals are kosher, and there is no bus-based touring on Shabbat. 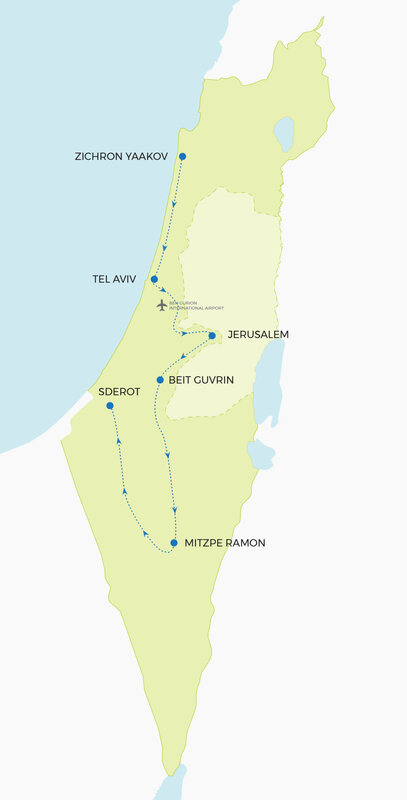 The itinerary is designed for travelers of all backgrounds seeking a “second timers” experience in Israel through the lens of Jewish history and identity. In short, you’re responsible for arranging your own flights to and from Israel, and we take care of most everything else! The program covers two meals a day, all touring, a fantastic staff team, accommodations (including luggage porterage), deluxe motorcoach transportation, and round-trip airport transfers on the arrival day and on the last night of the program. You’ll be responsible for one meal a day, specialty beverages at group meals and staff gratuities. Travelers be sure to note any special dietary needs as part of your registration. We will coordinate with our hotel and restaurant meal providers to arrange special accommodations as necessary. We try to accommodate all food and allergy considerations, however, we cannot make absolute guarantees on behalf of our meal-providing partners. Approximately 3 months prior to your trip, we’ll distribute a pre-trip package to help you prepare for your upcoming travels. You’ll also be invited to a trip Facebook group to connect with fellow travelers before the program and stay in touch after. Can I get professional assistance booking my flights? Yes! Travelers are responsible for purchasing their own flights to Israel, but you can get all the peace of mind from having a professional travel agency book your international flights without paying a premium. Get started at www.authenticisrael.com/flights.